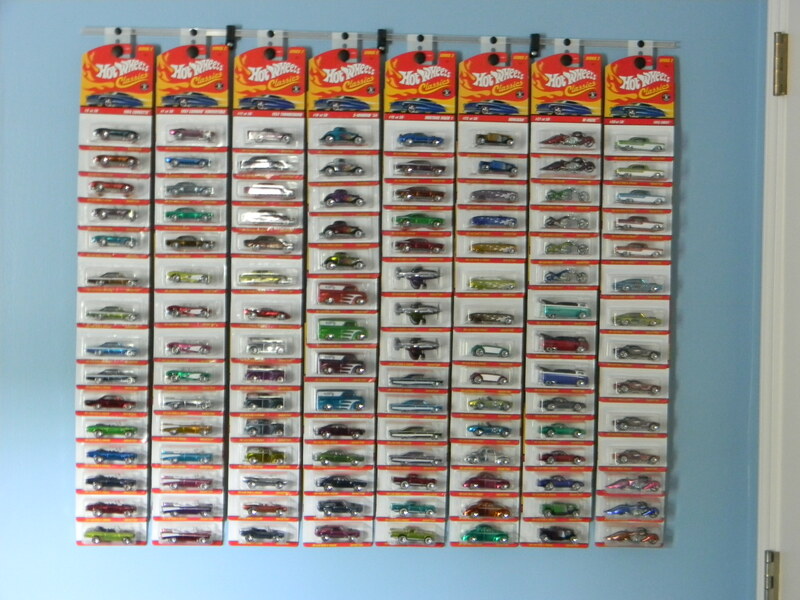 Hot Wheels Classics – Series 2: This is a custom display with standard size cards or ‘blister packs’ (also known as Full-Seal Blister Pack…see Package Lingo). However, if you inspect the layout of cards closely, you will see that the plastic blister pack varies due to the size of the die-cast it holds. Two of the 8 rows have 14 diecast cards (Blister Packs), while the other 6 rows have 15 diecast cards (Blister Packs). Yet the overall display is symmetrical top to bottom and left to right. This is made possible by adjusting the height (or hole used) of individual Blister Pack ‘cards’ on the D-Tracks. This flexibility utilizing CollHang allows you to layout the display in a symmetrical fashion. 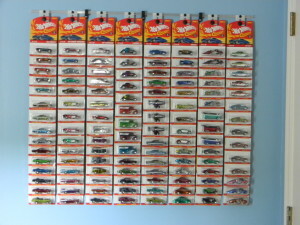 There are 118 diecast ‘cards’ in this set. And they are placed keeping the cards in their numeric model order. It measures approximately 36 inches wide by 30 inches tall. 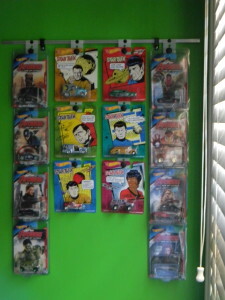 Star Trek / The Avengers: The next display involves two completely different type of cards. There are 4 standard size Blister Pack ‘cards’ on each side (8 total). These are all in plastic protectors. They were laid out to show off the entire artwork of the card within the plastic protector. And placement is set to just cover the top each of the lower 3 protectors on each side. The inner two D-Tracks hold 6 larger die-cast Blister Pack ‘cards’ with 3 in each row. These cards measure larger than the ‘standard’ Blister Pack cards and could not be placed on a display that only allows for the standard card size. However, with CollHang that is no longer a roadblock! This display measures 24 inches wide and approximately 28 inches high. 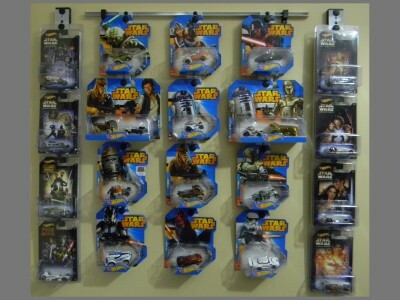 Star Wars / Star Wars Series: Here is a display with three completely different types of Star Wars die-cast Blister Pack ‘cards’. One type is a standard card in a protector. 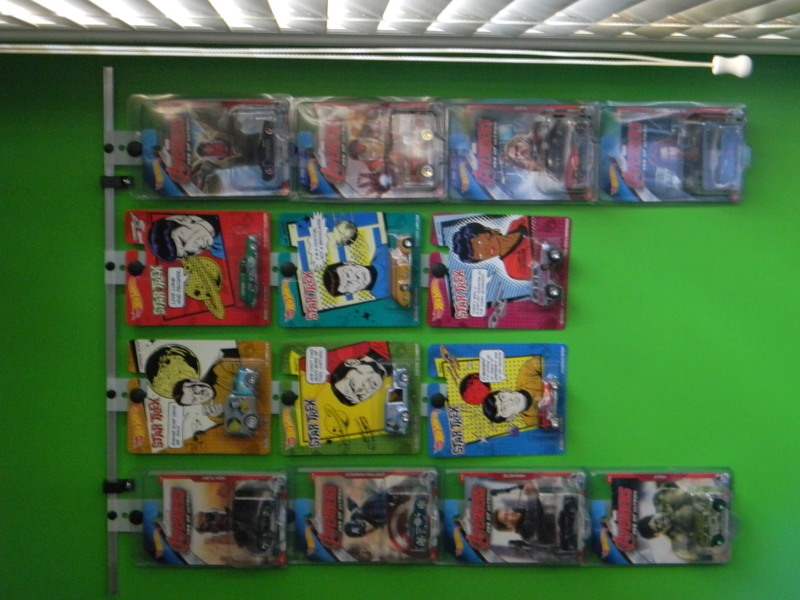 These 8 die-cast cards make up the le ft and right sides of our display. The others are the newest in the line of Hot Wheels die-cast cards. We have 9 individual die-cast cards, along with 2 of the larger packages holding two die-casts each within the Plastic Blister. The entire display is set up providing a pleasing symmetrical appearance made possible with the unique flexibility of the CollHang products. The display is laid out using a (1) 24 inch U-Rail system holding the 2 inner D-Tracks, while on the outside we have (2) Single mounts holding the D-Track, one on each side. Clamshell: A “Clamshell” pack is a fully plastic shell sealed at the edges. 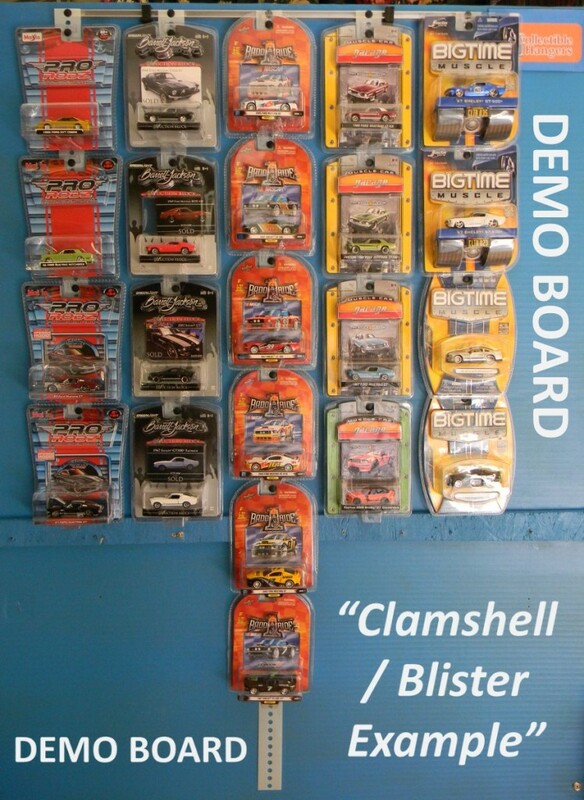 While “clamshell” is the actual type, most people will still refer to these as a “Blister Pack” (again,…see Package Lingo). The display below is great example of how Collectible Hangers is unique with ability to display this type of packaging. As you look closely, each row is a different shape Clamshell or “Blister Pack”.